Evolve MMA is the largest BJJ school in Singapore and is home to the first and only Renzo Gracie Brazilian Jiu-Jitsu school in Asia. 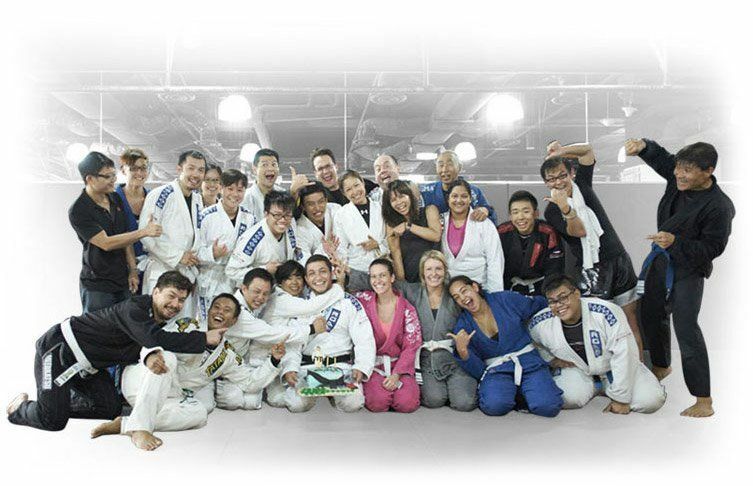 Our program is led by the largest and most accomplished BJJ instructor team in Asia. Our professors are authentic Brazilian Jiu-Jitsu World Champions and National Champions from Brazil. While training at Evolve MMA, you will have access to the premier program for learning BJJ in Singapore. Equally important, as a BJJ student in Singapore, you will be exposed to a variety of styles of BJJ due to the diverse backgrounds and styles of our BJJ instructors. The Brazilian Jiu-Jitsu classes in Singapore at Evolve MMA are divided according to the traditional BJJ belt ranking system. Beginner students will start in one of our white and blue belt classes, which place an emphasis on mastery of the most basic and fundamental BJJ techniques. Higher level BJJ students will have access to purple belt classes and black belt classes. Students in our BJJ program will learn chokehold and joint lock submissions as well as positional techniques and ground control. The objective of your BJJ training should be to obtain complete mastery of ground control and submissions. The Evolve Brazilian Jiu-Jitsu Instructor Team is the largest collection of authentic BJJ World Champions in Asia. The Evolve BJJ Instructor Team has won a collection of championships and medals at prestigious events such as the Mundials World Championship, Copa do Mundo World Championship, Brazilian Nationals, Pan American Championship, No-Gi World Championship, and many others. Our World Champion instructors have traveled across the globe to teach the beautiful art of BJJ in Singapore. Evolve MMA is an official Renzo Gracie Affiliate Academy. The Renzo Gracie Brazilian Jiu-Jitsu (BJJ) program at Evolve MMA is the first and only program in Asia that is officially recognized and endorsed by the legendary Renzo Gracie. Evolve MMA is proud to uphold the traditional values of honor, integrity, and courage of the legendary Gracie Family. At Evolve MMA, you can enjoy unlimited training, 7 days a week. We also offer special Brazilian Jiu-Jitsu and Self-Defense classes for boys and girls ages 4 to 13 through our Little Samurai Children’s Program. At Evolve MMA, we believe in giving our students a strong foundation through solid fundamentals. Our curriculum covers both self-defense and sport Brazilian Jiu-Jitsu. Students in the BJJ program in Singapore will benefit from improvements in their mental focus, cardiovascular endurance, balance, flexibility, strength, and coordination. The beginners classes in Singapore are primarily for white and blue belt students with the objective of gradually advancing them to the Brazilian Jiu-Jitsu Intermediate/Advanced classes. The students will learn fundamental techniques carefully chosen by our World Champion instructors that can be applied throughout the rest of their Brazilian Jiu-Jitsu journey. Evolve MMA’s Brazilian Jiu-Jitsu for intermediate/advanced students, also known as the Purple Class, builds upon the solid foundation developed through our beginner classes. These classes focus on an in depth exploration of the art of Brazilian Jiu-Jitsu. Based on a carefully planned curriculum created by our World Champion instructors, the objective of this program is to further advance our students towards the ultimate goal of earning a BJJ Black Belt. In these classes, our students will be exposed to more advanced techniques as well as live training sessions or sparring, creating a challenging yet exciting environment for students to further progress in their Brazilian Jiu-Jitsu journey. This class is perfect for any student who is serious about competition and determined to achieve the goal of earning a Brazilian Jiu-Jitsu Black Belt. If your objective is to compete in Brazilian Jiu-Jitsu, you may try out for the Evolve Brazilian Jiu-Jitsu Competition Team, the largest amateur competition team in Asia. Members of this team will be trained to compete in the toughest and best Asian competitions as well as world championship events all over the globe. Our competition team members regularly compete on the local BJJ circuit, and it is our goal to prepare them for success at the Mundials, ADCC Championships, and other top BJJ tournaments. We pride ourselves on being the very best competition team for Brazilian Jiu-Jitsu in Singapore. Brazilian Jiu-Jitsu (BJJ) is a martial art based on grappling and ground fighting. It focuses on the skill of controlling your opponent and applying techniques that force him or her to submit. Most of the techniques learned in Brazilian Jiu-Jitsu concentrate on taking your opponent down to the ground and keeping them there, enabling you to attack for submissions. Studies show that 95% of street fights end up on the ground, making Brazilian Jiu-Jitsu one of the most effective, real-life fighting systems on the planet. Brazilian Jiu-Jitsu enables the smaller, weaker practitioner to use leverage, grip, and position to overcome a bigger and stronger opponent. It is a highly technical martial art that not only provides its students with a deeper understanding of the workings and limits of the human body, but also equips them with problem solving skills and greater body awareness.